With Derrick Rose, now after four Bulls preseason games, it’s perhaps just about looking for flaws. And, amazingly enough, there don’t seem to be any. Difficult to argue as Rose played his first game in the United Center since his devastating April 2012 knee injury — for a Chicago audience that has heard all the positive talk but wanted to see for itself — and with 22 points in 22 minutes that included nine of 10 at the free throw line and an assortment of flying, acrobatic drives and dunks, the MVP chants were back. Now, it’s time to get on with the season. Bulls coach Tom Thibodeau, the master of the moment, probably got hives reading that. But excuse this team and Rose for a moment. They are no longer kids thinking about an impossible dream. Their windmill suddenly seems within reach. That’s naturally with the return of Rose, who has impressed perhaps most with a lack of any hesitation. Rose told everyone he was ready to go. And he would be fine. Really, no one fully believed him. No one comes back from these ACL injuries, even with as long as Rose remained out, playing with the same furor. But Rose has. After a stirring national anthem from Bulls purchasing manager Ben Adair and Rose’s familiar greeting from public address announcer Tommy Edwards that, “From Chicago…,” Rose was welcomed long and loudly with flashing lights and not so flickering hopes for the player who was once league MVP. And though Rose doesn’t speak to the occasions with grandiloquence like Michael Jordan and Kobe Bryant, Rose knows as well his value and his role as a player and entertainer. He scored the first basket of the game, switching hands on a driving layup, he drove shortly after that without hesitation and was fouled, making one of two free throws and then took the ball at halfcourt and blew through the Pistons defense and past the athletic Andre Drummond at the rim for a layup and five points in the first four minutes and a 10-4 Bulls lead. It’s one thing to say it, but Rose also has shown it. There was no sign of the soreness that kept him out of the preseason game in Brazil and no indication from Rose or anyone that it was a potential problem or concern. Not that Rose or anyone else wants to jump too far ahead since they know the vagaries of the long season and their own history of misfortune. But you get a sense of purpose around this Bulls group that they have the pieces, the experience and have experienced the hard knocks to know what it takes and that they can do it this time. Of course, there’s a long way before they’ll truly be tested. But they seem quietly and confidently satisfied with the early result in their 4-0 preseason start. Jimmy Butler sat out with a knee bruise. But he said it was not serious and he would play soon. The Bulls host the Indiana Pacers in the United Center Friday. Mike Dunleavy started at shooting guard for Butler. Dunleavy had nine points and five rebounds in about 17 minutes. But he showed a savvy, mature and sophisticated game with ball movement and team defense that was impressive. Taj Gibson continued his strong preseason with 11 points and 12 rebounds and Carlos Boozer added 10 points and 11 rebounds, both in fewer than 25 minutes. Marquis Teague had 11 points in his longest preseason stint. 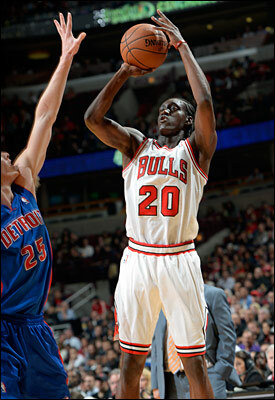 It was also the best performance for a rookie as first round pick Tony Snell had his best game with 12 points in about 25 minutes, including two of four three pointers with finally a nice shooting touch and solid defensive placement. With that sort of play he could earn more minutes than expected, though Thibodeau lamented the second unit letdown in the fourth quarter after the Bulls were ahead by 25. And defensively as the Bulls dominated Detroit’s new front line of Drummond, Greg Monroe and Josh Smith, Joakim Noah returned from his groin injury to play in his first preseason game. Noah reported no ill after effects in about 20 minutes with eight points and three blocks. He had just two points with three shots. And perhaps the team as well. “It’s good to have the joker back,” said Noah referring to Rose. Not necessarily for any prankster sense of humor, but for that wild card in the deck that makes your hand a winner. That’s Rose, and it was inspiring to see his daring and impressive play, which included a 10-point second quarter that gave him 18 for the first half as the Bulls pretty much put the game away leading 55-34. And efficient, hitting a three after Snell stole an inbounds pass and found Rose and then taking another flying Wallenda trip through the Pistons defense to close the first half. Rose first lined up guard Peyton Siva, crossing him over and going to the rim, twisting and contorting his body as he got past both Drummond and Monroe, falling and put in a layup for a three-point play. No, he wasn’t showing off. No, he wasn’t doing too much for a preseason game. It was just Derrick being Derrick, the only Derrick he knows how to be, driving at the basket like he always did growing up, taking it at the big guys and picking himself up and making his free throws. Just hoopin’. 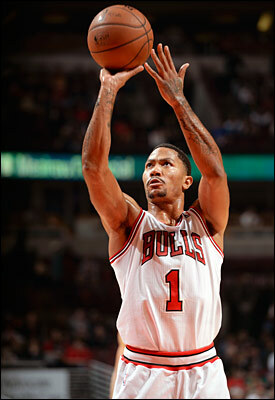 “I’ve still got to knock some rust off, get my feet under me for my jump shot,” said Rose. “That’s it. My timing is coming with playing these games. “It felt good playing out there in front of the home crowd again,” Rose went on. “Almost every one of these games at home it’s going to feel like every time I touch the ball there’s going to be some excitement. So I’ve got to get used to it and keep my mind on the game plan and play the way I know how to play. “I’m past that,” Rose said when asked about being emotional on a return. “The jitters and everything for me should be out. For me, it’s about going out there and trying to compete and get better as a team and as a leader. I can’t get caught up in (the ovations), but I love it. “I was just trying to be aggressive,” Rose said about that special drive to close the half. “That move I did, that’s the way I normally know how to play. For me, that was just trying to do anything to get to the basket. I’m not worried about anything. I don’t have any aches or nagging injuries or anything. I’m really taking care of my body and really preparing myself for this long season. Rose did acknowledge he’ll be a target. Though that is nothing different. He said he absorbed some hard shots Wednesday. You can come home again.